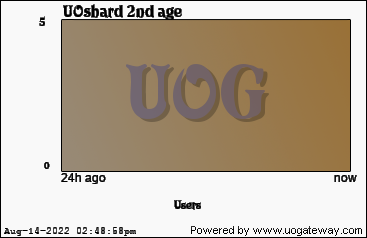 UOshard 2nd Age - The best 100% free Ultima Online Shard. DOB 01/2018. It's running on latest ServUO (OSI emulator) version with custom expansions. Original UO Classic and Enhanced Client fully patched. TOL expansion. Fast skills gain. No max skills cap. Power hour (+5% bonus on stats / improved skillgain / improved gold loot). Updated every week. Running on enterprise hardware with gigabit internet connection. Ultrafast worldsaves. Online 24x7 for your pleasure. 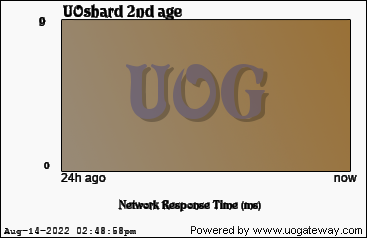 Are you a good UO player? Check out our exclusive web rankings. Don't waste time elsewhere, come on and play with us! Just refined and progressist UO players. Stats last updated 7779 seconds(s) ago using 102313 data samples.